This voyage takes you to a rich variety of Atlantic islands. Iceland is the perfect destination for explorers searching for the unexpected, while volcanic Jan Mayen rises from the mid-Atlantic ridge - snow-capped and surrounded by oceans full of life and Svalbard, is home to the King of the Arctic; the mighty polar bear. Enjoy all aspects of these fascinating arctic islands. See the great eastern nature reserves and some of the most spectacular scenery on Earth. Join us to experience powerful nature, adventure and history aboard a modern and comfortable expedition ship, the MS Spitsbergen. Many visitors find landing at Keflavik airport enchanting. The hub seems carved out of an arctic desert, with lava stones covered in moss and haunting mountains nearby, but just 45 minutes away, you will find the charming and vibrant modern city of Reykjavik, offering excellent restaurants, interesting museums and quaint narrow streets. West Iceland is often referred to as the Sagaland. Experience Stykkisholmur's storybook landscape of lava and rock formations, glaciers, volcanic activity and hot and cold springs. Explore the town on your own or join optional excursions to explore more of the Snæfellsnes Peninsula, which is said to be a miniature version of Iceland. In addition to the Snæfellsjökull glacier, there are black sandy beaches, bird cliffs, spectacular mountains and volcanic craters. On the charming island of Flatey, time appears to stand still. Take a stroll around the scenic lanes of this tiny village. One of Iceland's best-kept secrets is the magical area of Westfjords. In the morning hours we sail around the tip of the Látrabjarg peninsula. If conditions are right, you can see the Bjargtangar lighthouse, Europe's westernmost point, from the deck. Flanked by towering mountains on all sides, Isafjordur is a nearly perfect natural harbour. Take a walk to see the local architecture, browse for local handicrafts and come across the oldest houses in Iceland, including the structure that houses the Maritime Museum. The Hornbjarg cliff is one of the greatest sea bird habitats in Iceland. From deck, you will be able to enjoy the spectacular views of the wildlife. Reykjafjordur can only be reached on foot or by boat, and we plan to take a closer look at this stunning area as well. Enjoy a relaxing day at sea with on board lectures while we set course towards Jan Mayen. Our Expedition team will hold talks and workshops to share their knowledge and experience, further enhancing the next days of our journey. The Norwegian island of Jan Mayen is one of the most isolated places in the World. Located where the North American and Eurasian tectonic plates meet, the island is dominated by Beerenberg, the northernmost active volcano on earth. Dutch whalers operated from Jan Mayen in the 16th century, but today only a Norwegian weather station accommodates a few brave individuals throughout the year. Visits to Jan Mayen are extremely rare, especially from tourists. As one of the few vessels operating in this area, MS Spitsbergen and her crew will attempt to make a landing on this most exotic Arctic island. Another day at sea as we set sail for Spitsbergen. Take an invigorating stroll on deck or enjoy the company of your fellow adventurers. The North West Corner of Spitsbergen is scattered with islands, fjords and beaches. The ocean here is full of drifting ice and the frozen landscape changes constantly. Due to strong winds and currents, the Captain monitors conditions closely, before deciding where we can land or sail. This is why all itineraries need to be flexible; we work with the elements, not against them, and safety is our first priority. 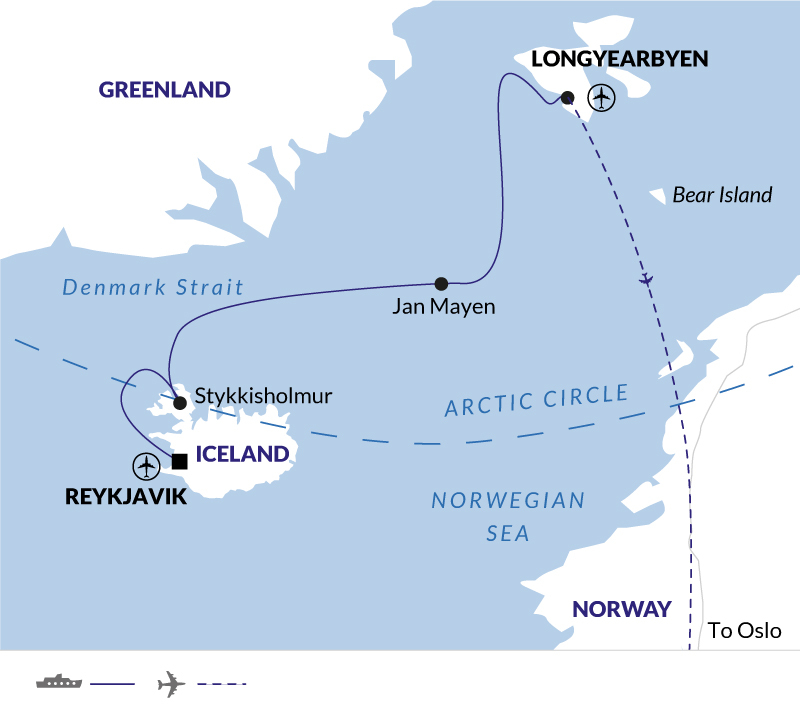 Landings in the area offer an excellent insight into Svalbard's history. You will have the chance to see the remnants of antique blubber ovens used to render whale oil. We might visit Kongsfjord, considered one of the most beautiful fjord areas in Spitsbergen, with mighty glaciers calving icebergs into the sea. All of which is nicely framed by stunning mountain formations. On the shore of Kongfjord is the former mining settlement of Ny-Alesund, now an international centre for research, with a picturesque mix of old and new buildings. We hope to visit Liefdefjord, the location of the enormous Monaco Glacier. There is a chance for small boat cruising here, or possibly a landing and a hike, if conditions allow. In Magdalenafjorden, a gently sloping sandy beach may give us the chance to go swimming and earn an Arctic swimming certificate! Named after the Arctic crown of Norway - the archipelago of Spitsbergen - the MS Spitsbergen was built in 2009 and has recently undergone a complete reconstruction in 2015-16. The ship features high standards throughout and public areas and cabins are comfortable and spacious - offering a peaceful haven at the end of a busy day exploring the Arctic wilderness. There is ample outdoor deck space to view the passing scenery, or you can keep a watchful eye from the bright and airy lounge area with its large picture windows. Cabins are well equipped, all en-suite, and there are a variety of cabin types to choose from. The ship also offers some extra amenities such as a Jacuzzi and fitness room. The Scandinavian design is fresh and modern and the ship's manoeuvrability and optimal size, allows for easy navigation in polar waters. Lead-in prices are based on the use of inside category cabins. Category one cabins are based on twin share, with one upper and one lower bed. They are comfortable with a private toilet, shower and TV. The MS Spitsbergen has a number of different cabin categories, many of which are outside facing, with two beds (apart from superior cabins and suites, which have double beds). Some cabins have portholes and others, larger windows and sitting areas. All cabins are twin share, but we can also offer single occupancy at a supplement, if you are travelling alone. Call us for details on the cabin choice to fit your requirements.